Apart from the Stuttgart Weihnachtsmarkt, my second favorite Christmas market in the region is in Esslingen. The reason for this is two-fold. Firstly, after a while I find that most Christmas markets that I've been to are pretty similar: they all have Glühwein and most of the same arts and crafts. Secondly, Esslingen takes a fun spin on the theme by featuring a Mittelaltermarkt or Middle Ages market. And so in order to share with you the Middle Aged magic of the market, we headed out to Esslingen this past weekend to take in all the sights and sounds of the season. Upon disembarking from the S-bahn Saturday afternoon, we made our way down Bahnhofstraße and towards the old part of town. Esslingen is a beautiful little town in its own right surrounded by the rolling hills of Stuttgart's vineyards and located next to the lazy flow of the Neckar river. In fact, one of my favorite views of the city is from the bridge across the canal that cuts through the town, because there's a beautiful half-timbered house set against the backdrop of the double-towered St. Dionys church. This year the house (which I'm pretty sure is a shop or restaurant) was festively decoration with numbers in the windows like a giant Advent calendar. Just past the church, we entered the main market area in the Marktplatz. We saw all the usual Christmas market food and gifts there, so we quickly shuffled past on our way to the entrance into the Mittaltermarkt around the Rathaus. Tip: The Kessler Sekt cellar, Germany's oldest producer of sparkling wine, is located just behind the St. Dionys church. They have a very stylish tasting room, and they even set up a large, heated tent in the winter, where you can stop by and taste some of their delicious Sekt. I highly recommend it! The Mittelaltermarkt market begins at the Rathaus, though it's scattered around the building, up and down a number of tiny, cobblestone streets. The area was crowded, but not too bad on our Saturday visit. Even though the Mittelaltermarkt has much of the same Christmas crafts for gifts, there's a distinctive Middle Ages spin (obviously). 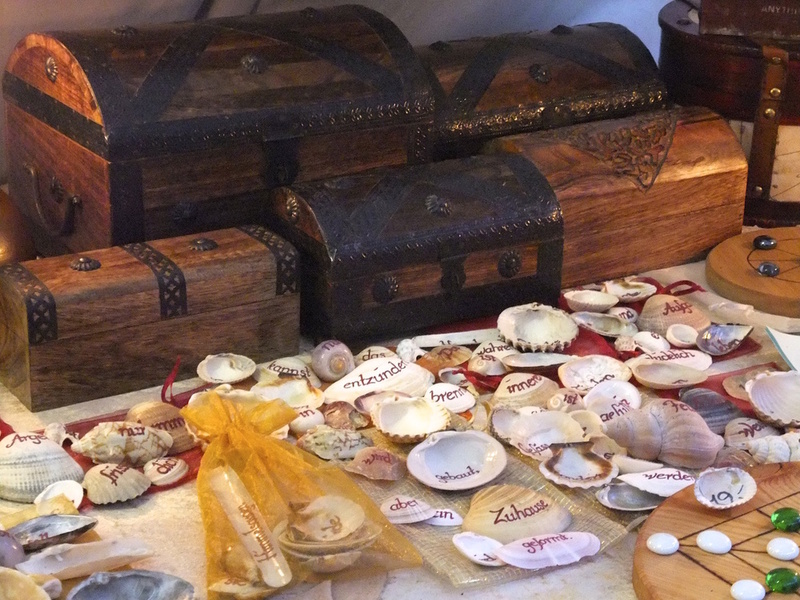 We saw tons of drinking horns, jewelry, liqeuers, baskets, spices, painted shells, gargoyles, treasure chests, and more. I particularly like one stall near the entrance set up by a crafter who was carefully cutting out the image in coins to create some really cool necklaces (see the picture). 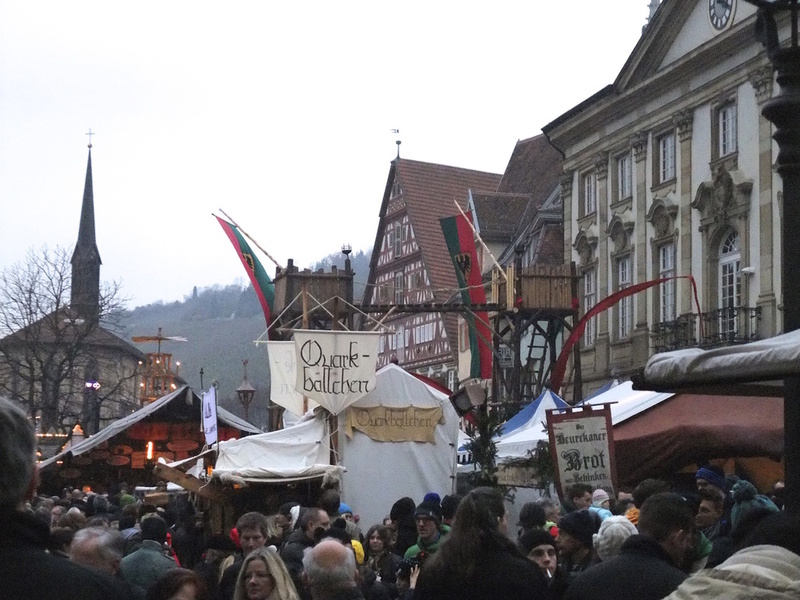 Another big draw of the Mittelaltermarkt are the various crafts and games that you can play around the Kleiner Markt. Among the most notable are the children's wooden Ferris wheel and the archery games around the back. There's also a really fun game like roulette that looks a tiny arena with numbered boxes around the outside. You place your bet for a box, and then a mouse is released into the arena. If the mouse chooses your box, then you win! I suppose this next one isn't so much a game, but we saw a couple sawing the end off a log in some kind of ceremony. Lots of people were taking pictures of them, and then the sawed-off end was branded and given back to the couple I suppose as a souvenir or for luck. And of course, there's the usual candle-dipping stall for children. On this visit we even caught sight of a really cool parade going through town. There was a colorful woman in a sunflower hat jumping and dancing around, followed by a goat-man with a long horn announcing the arrival of the musicians with more horns and stretched-leather drums. And the end, there followed a giant man-of-the-forest snarling on stilts. The parade made its way from the Rathaus to Hafenmarkt where we also got to see some jugglers perform before the parade returned to the Rathausplatz. Okay, and now the part you've been waiting for...the FOOD! Glühwein from the Middle Ages! Our first stop was, of course, Glühwein (mulled wine). In the Mittelaltermarkt, the Glühwein comes in rough clay cups. I think most Glühwein is basically the same, although the Glühwein that we tried may have been a bit sweeter than the kind we normally get that the Stuttgart Weihnachtsmarkt. Another drink I'd recommend at the Mittelaltermarkt is hot Met (mead or honey wine) which seems common at other Middle Ages-themed events that I've been to. After warming up with a mug of steaming wine, we made our way around in search of food. I'd passed some tasty looking Flammkuchen (Alsatian-style, thin-crust pizza) several times by this point, and so I decided to get some for my first course. Craving some vegetables, I ordered a Flammkuchen topped with green beans, carrots, and peas at a little stall just around the corner from the Rathaus. The vegetables were, in all honesty, probably from one of those freezer bags of mixes, but the bread and cheese were good. Still, I wasn't terribly satisfied, and so we set off to find something else. Right around the back of the Rathaus we came upon a popular stand that we remembered from last year: the "hemp stall". They sell sautéed turkey meat in kebab spices stuffed with cabbage slaw inside of a hempseed pita and topped with yogurt sauce and what appeared to be some kind of white lentil salad. The stand was packed, like last year, but Matt decided to spend the time in line (about five minutes or so) for the sandwich. I can't say that hemp seeds really tasted like much, though the bread was a bit nuttier than the usual white pita. The tender turkey was the real star, giving the sandwich a juicy, spicy bite. I, however, wasn't completely full, and so I decided to try the hot, steaming rolls of bread at another stand that were just coming out of the oven. The little rolls were cooked alltogether, and then separated and served with a dollop of sour cream and green onions on top. Inside, the bread was filled with gooey cheese and bits of ham. I'm not entirely sure what they were called (the sign looks like it says Beurekaner brot mit Schinken und Käse in my picture, but I can't seem to find this in a Google search), but either way, it was really good. Then of course, being the insatiable market-goers that we are, we decided to stop for a cone of hot Quarkbällchen on our way out. Quarkbällchen are basically fried donut holes covered in powdered sugar, but with a heavier texture than the usual American donut batter. That's because the batter has Quark in it, which is a kind of fresh cheese common in Germany. The taste is difficult for me to describe because I've mostly only had it in German-style cheesecakes and strudels in which it's sweetened. One of these days I'll get around to buying some fresh at the store. The Quarkbällchen were similarly sweet (by German standards), and were tasty, but filling. If fried donut-like holes aren't your thing, then there are also plenty of waffles and sweet crêpes to tempt you, as well as the usual cones of chestnuts and candied nuts. Another sweet treat that I would recommend are the Kürtöskalás, a Hungarian pastry that looks like a hollow cylinder, located in the middle of the main Marktplatz. They're made by wrapping a long rope of dough around a wooden cylinder, and then rolling the dough in butter and sugar before setting the wooden cylinders in the oven. As the dough cooks, the sugar melts to form a caramel-like crust. The cone of hot dough then gets another roll through the topping of your choice, including cinnamon-sugar (my favorite), chopped nuts, coconut flakes, or chocolate chips. This seemed to be a popular market treat when we were in Prague, too. In past years, we've also had the Käsespätzle from a stand in the Hafenmarkt that was delicious. If you like novelty foods, then you should also try the bread baked onto a stick just near the entrance to the Kleiner Markt. Most of the food at the Mittelaltermarkt, and at the Christmas markets in general, I would say, tends to be bread, meat, or cheese related. However, we did see a yummy looking soup stand with pumpkin and onion soups behind the Rathaus, and I made a mental note to try the soup next year. I also noticed a big roast pig on a spit that I would have loved to have tried on our way out of the Rathausplatz, but I was too full to fit anything else into my stomach. We did, however, take a couple of snacks home. Fudge is such a rarity in Germany, that when we saw a case full of it next to the Quarkbällchen stand, I knew I had to get some. My favorite is vanilla fudge, though they had other flavors like mint chocolate, mango-yogurt, sea salt, cherry brandy, and honey nut. It wasn't as soft as the fresh fudge that I'm used to, but it was still good. We also picked up some fresh Stollen, the traditional German Christmas cake made with dried fruit, nuts, and sometimes marzipan. They had some huge loaves of it in a stall just inside the entrance to the Weihnachtsmarkt on the Marktplatz that they were cutting into smaller pieces to sell. By the end of our visit, the sun was setting and the crowds were getting so dense that we had to pick Leo up and carry him at one point for fear that he would get stepped on. We had a lovely day, but I would highly recommend you go before 4:00 pm when its starts to really get crowded. Better yet, go on a weekday if you can. Note that the market is open from now until December 22nd and closes at around 8:30 pm. Whenever you go, enjoy yourself as it really is a neat take on the traditional Christmas market theme! Have you been to the Esslingen Mittelaltermarkt? What was your favorite part?